Hi ladies! Hope everyone is having a wonderful week so far. Can we just talk about this location for a second? 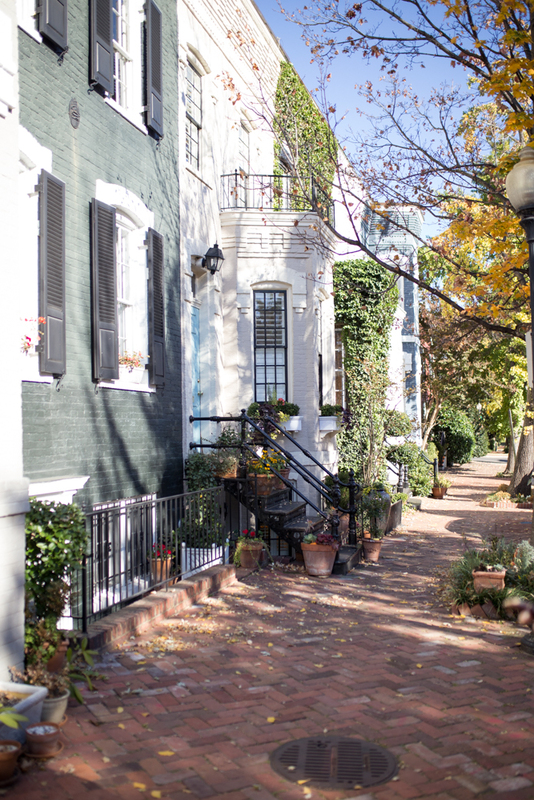 We shot this look while we were walking to Georgetown from our hotel, and we stumbled upon these gorgeous little side streets. Every block we walked they got prettier and more adorable. From the fall leaves and pumpkins, to people walking around in their big sweaters and scarfs, it felt like we were on the set of a fall movie! 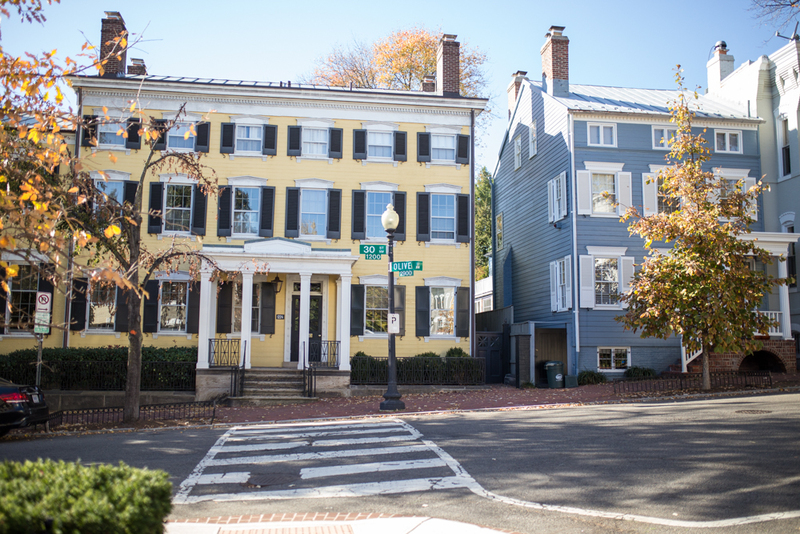 No shortage of heart eyes in Georgetown. This was the perfect look for exploring on a chilly day! We did a ton of shopping and eating, so I wanted to make sure I was wearing something comfortable – not cumbersome. This seude moto jacket is one of my favorite fall pieces that has been in heavy rotation. It’s great for layering, is a neutral that goes with everything, but it also keeps you super warm. This option is one of my favorites that I just ordered in a wine color, but there is also an identical colored one of the one I’m wearing here! It sold out so quickly during on Nordstrom this summer, I’m glad it’s still around and as popular as ever. If you’re looking for the perfect outerwear pieces, definitely check out this section at Nordstrom. Almost all of the pieces are under $200 and so cute! I layered it over a winter essential that I feel like I can never have enough of – a white cable knit sweater. I always see a lot of cable knits being dressed up or with a little bit of a preppy look, but I love how it looks styled down and casual! This one is so soft (I loathe itchy sweaters!) and is a great thing to pick up for this time of year! They are one of my favorite pieces to wear on Christmas day thrown over a fun plaid with leggings (when I’m not in my xmas PJs). With my over the knee boots, checkered scarf and aviators, it was an easy travel look that I will definitely be repeating next month when Armaan and I head to Deer Valley! What are you ladies up to this weekend? I’m finally finishing painting my office (hooray!)! Thank you to Nordstrom for partnering on today’s post! All opinions are my own. Thank you for supporting the brands that support Blonde Expeditions. I love (and desperately need) this jacket. I’ve been looking at it forever and I just need to take the plunge. It’s perfection. Such a cute outfit! This is outfit goals! You wore this cable knit perfectly. Not preppy but still classic!! Very nice jacket and I love the tall flat heel boots for a relaxing weekend day. I do prefer high heels but I can’t wear them every day. Lovely look perfect for fall!! !